A real 2-in-1! A helmet with an even more chic incorporated visor to give the model a die-for look on the slopes. 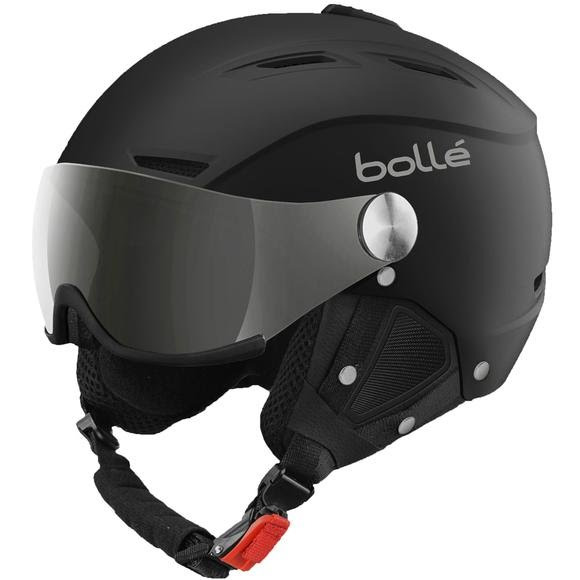 Bolle®'s Backline Visor has an adjustable ventilation system, removable ear plugs and a Click-to-Fit size adjustment system. Foam lining sits at the base of the internal visor for greater comfort and better adjustment to the face. A real 2-in-1! A helmet with an even more chic incorporated visor to give the model a die-for look on the slopes. Bolle® &apos;s Backline Visor has an adjustable ventilation system, removable ear plugs and a Click-to-Fit size adjustment system. Foam lining sits at the base of the internal visor for greater comfort and better adjustment to the face. Its ultra-resistant ABS shell means skiing in total safety.The Backline Visor is delivered with two visors (category 1 and category 3) for perfect visibility, whatever the light conditions. The adjustable ventilation system is easy to use and allows you to adjust the amount of incoming air flow. Adjust the fit very precisely. On the hill, you can tighten or loosen the helmet for perfect fit. ABS Injected helmets guarantee strong resistance and high capacity shock absorption. In QR Code, the QR Code can be used to determine which QR codes should be used. This exclusive BOLLE option makes your outings safer.